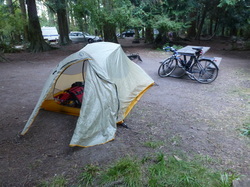 Any touring biker who plans to camp will need an ultra light tent, ultra light sleeping bag and and a light pad. All these items have to fit in a compact space when packed. The Big Agnes Fly Creek UL3 fits the bill weighing in at just 3.6 pounds. It is an ultra-light weight backpacker tent which holds three persons or one plus all the bags from the bike. It is a cinch to set up and very high quality material and construction. The ultra light down sleeping bag is the MontBell U.L. Spiral Hugger #3 Sleeping Bag: 30 Degree Down. Winner of the Outside Magazine Gear of the Year Award the sleeping bag is a great combination of classic mummy cut, innovative construction, high quality 800 fill down, and ultra light fabric. This bag is very light checking in at only 1.2 pounds. Spiral technology allows amazing interior space and more stretch than a typical bag. It is rated to 30 degrees.